Valentine’s Day at school is always such a fun holiday for my kids. They love to exchange notes with their classmates and I always have fun reading all the cute little cards when they bring them home at the end of the day. 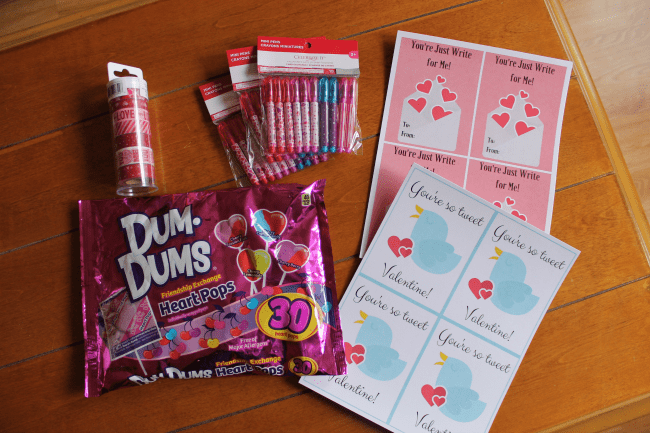 This year, however, instead of buying them at the store, we decided to make some of our own printable Valentines for school. 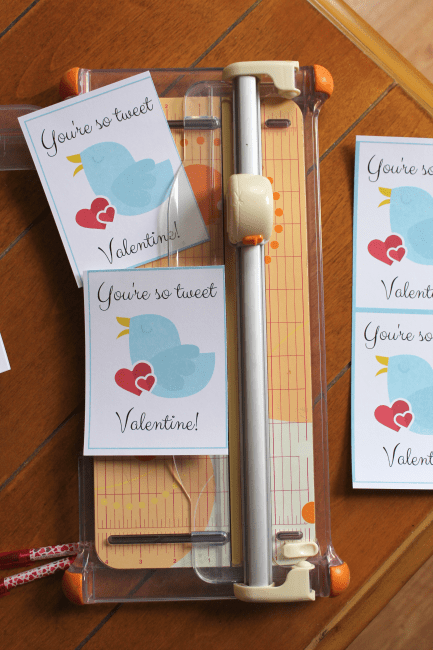 I thought it might be easier to print some pretty cards at home instead of trudging through the Valentine’s aisle at Target, trying to find the package of cards that had matched the number of kids in our classes. The designs we came up with have just delighted my kids and they can’t wait for Valentine’s Day to come so that they can pass out the cards to their friends. These printable Valentines come 4 to a sheet, and you can print as many copies as you need to fit the number of kids in your child’s class. We printed our cards on some inexpensive cardstock so that they would hold up a bit better. 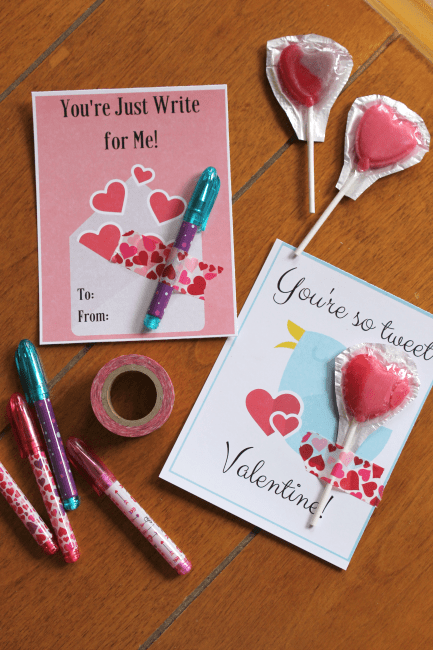 Then we chose some treats that we thought would fit with the theme of each Valentine…pens for the letter Valentine and a lollipop for the bird Valentine. To add a little more holiday spirit to the cards, we decided to attach the treats with a piece of Valentine-themed washi tape. The kids had fun experimenting with the tape, and there’s plenty leftover for other craft projects or to save for next year’s Valentines. 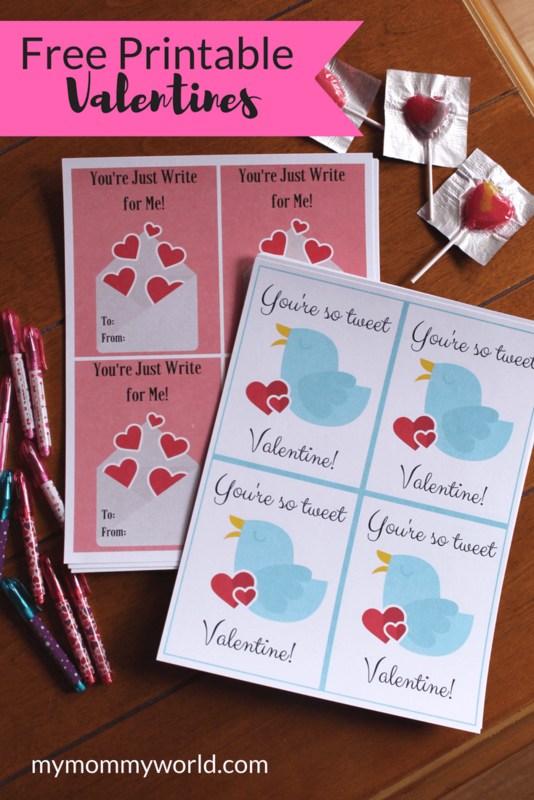 Hope these free printable Valentines for school help your kids have a very Happy Valentine’s Day! These cards are so cute. Thanks for sharing them! These are more than adorable! You are so smart to just make your own cards. I rarely ever see store bought ones that I just really love for my children! Pinned!